All Great Stops stores are open 24-hours a day, seven days a week and provide a wide array of goods and services to the community. 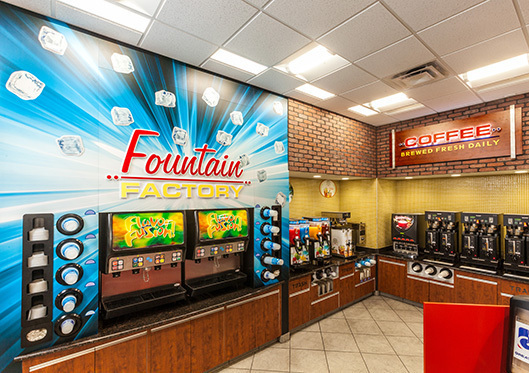 In addition to standard convenience store products like gas, diesel, snacks, and drinks, Great Stops has delicious hotdogs, sausage dogs, roller-grill taquitos, fresh condiments, and boiled peanuts available at most locations. We provide gourmet coffee with a variety of flavors and always from the best beans available. Most locations also have a financial services center located within them so that customers can cash checks, pay bills, and send or receive money using our Western Union services. We also sell Western Union money orders as an added convenience for our customers. All Great Stops locations have a 24-hour laundromat connected to them that accepts coins, debit cards, credit cards, and our very own reloadable wash card. You will even find that some of our locations have a Little Caesars restaurant inside of them. Come check us out today!